This course was created for Core Data targeted iOS 10 and 11. Unlike when iOS 10 was introduced, this time around there has been no significant changes moving from iOS 10 to 11. Having said that the Core Data skill that you learnt under iOS 10 will still be applicable for project targeting iOS 11. However if your project is dealing with older version of Core Data in iOS 9 or prior, and you intend to learn the previous version, my other course Mastering iOS Core Data with Swift is the course you want. What is Core Data? Why should I know about Core Data? 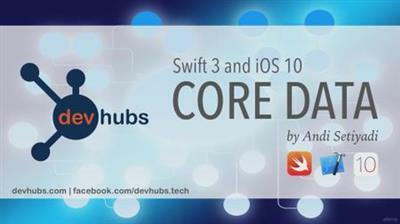 Core Data is one of the most powerful framework that Apple has provided for developer. "Core Data is a framework that you use to manage the model layer objects in your application. It provides generalized and automated solutions to common tasks associated with object life cycle and object graph management, including persistence." - Source from Apple". If you are passionate about learning mobile development for iOS and looking to take your iOS development skills to the next level, Core Data framework should be at the top of your list. By the time you are done with CoreData for iOS Development in Swift course, you will be ready and very confident to take on any Core Data project coming your way. On top of that, you will be one step closer to become a well rounded iOS developer. Throughout this course we will look in detail the Core Data framework to provide data storage functionality in iOS applications. We will start by creating a simple app that is utilizing Core Data framework, building our own Core Data stack and eventually using all different Core Data features into our application. We will cover the various ways on fetching our data and how to efficiently using Core Data in our app. Unit testing and performance tuning will be an important part on how we can monitor our app performance in conjunction with Core Data in our application. Along with Core Data versioning, migration and iCloud integration, I will take you on developing 5 iOS applications and how we can integrate all of these components into Core Data. Lots of students have different methods of learning. Through out this course I will provide both the starter and final Xcode project solution, so you can either follow along one step at a time or you can jump directly to the final solution. And by the end of this Core Data in Swift 3 and iOS 10 course, you should be comfortable and ready to integrate Core Data framework in your application. Target Audience: All iOS developer that would like to take their skills to the next level. This course is meant for iOS developer who knows the basic of Swift development and would like to learn Core Data framework. 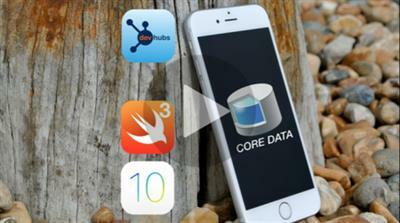 All iOS developer should know about CoreData. It is one of the most powerful framework provided by Apple.